Chinese horoscope compatibility predicts that those born under the zodiac signs of the ox and the sheep have their work cut out for them. Is there a way for the somber ox to make it work with the wistful goat? Can the Ox and Goat compatibility learn to compromise? Will it be enough for them to be successful and in love in the long-term? The Ox and Sheep in love can actually work well together if given the chance because the overemotional goat who is sometimes unsure will welcome the ox’s truthful attitude and reliable nature. For the Ox and Sheep friendship to be successful, they will have to work hard just to ensure their relationship is relatively without any bickering. Their personality traits are highly opposite and don’t complement each other the way some might. The ox is traditional and logical and the romantic, curious goat will probably feel suffocated because of this. They will think of their partner as being overly sensitive and foolish. At the same time, the determined, realistic oxen will be put off by the sheep’s delicate and nervous nature. It’s true that neither of these Chinese astrology signs display necessarily bad traits. However, these two may find they are putting extra stress on the relationship if each is continually trying to adapt and adjust their personality to better match their partner’s. Whether they are just friends or are romantically involved, they will have compatibility issues either way. When the Ox is dating the Sheep, he or she will be nervous and personal and will be trying to talk about anything but themselves. On the other hand, the ox who tends to be very resolved and even judgmental in social situations, will come off as more somber and stubborn than they actually are. The ox male might find the female goat somewhat strange or eccentric. The male goat might see the female ox as having a lack of creativity. If these two Chinese zodiac signs can learn to appreciate each other and refrain from criticizing each other’s differences they could very well make this Ox Sheep marriage compatibility work. The Sheep’s occasional unsureness will be dissipated by the ox’s steady and guarding mannerisms. However, they in turn expect certain things from their lover because of this. Even in bed, the ox is serious while the goat wants to have some fun. Sexually these two signs are not compatible. The ox is not fond of the goat’s tendency to be fickle. They have an obedient attitude when it comes to keeping things running smoothly, like house and family. The sheep will find they feel discouraged because of the Oxen’s pressure on them to be more industrious. They are creative and prefer relaxation which can stress their lover. They take delight and revel in doing as they please. They have a pampered lifestyle. This is not taken well by the Ox and this can lead to the breakup of the Ox and Sheep love compatibility. Typically in a Ox man and Sheep woman relationship, a goat needs to feel adored and respected in order to perform well at anything. They are creative and wait for inspiration to occur. The Ox scoffs at the goat’s quiet ways. They feel that the Sheep spending energy on these sort of creative endeavors is a waste of time. Understanding won’t completely allow these two Chinese zodiac signs to work things through. The ox woman has to be more understanding of what makes the Sheep man tick. Other than that, the compromise will only work for the Ox and Sheep soulmates if it is much more definitive and not so petty. This means their compromises have to be much bigger than in other relationships and will take far more work to make them stick. 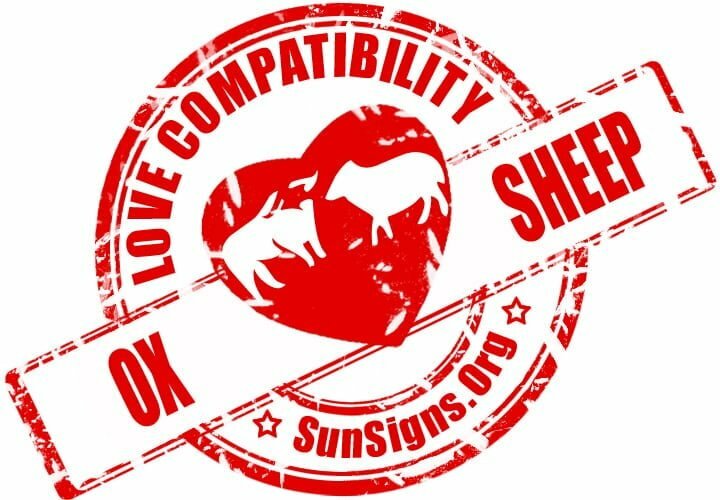 Ox & Sheep Chinese Horoscope Compatibility Rated 2 Hearts!